WASHINGTON — When the first allegation of sexual misconduct against Supreme Court nominee Brett Kavanaugh — by Christine Blasey Ford — first surfaced a week ago, Ford’s husband said why the allegation mattered, even if it was from 35 years ago. “The woman at the center of the story, Deborah Ramirez, who is fifty-three, attended Yale with Kavanaugh, where she studied sociology and psychology. Later, she spent years working for an organization that supports victims of domestic violence. The New Yorker contacted Ramirez after learning of her possible involvement in an incident involving Kavanaugh. The allegation was conveyed to Democratic senators by a civil-rights lawyer. Kavanaugh denies the allegation. “This alleged event from 35 years ago did not happen,” he says. “The people who knew me then know that this did not happen, and have said so. This is a smear, plain and simple.” And there are plenty of caveats about this new accusation: It was initially made to Democratic senators; Ramirez admits gaps in her memory; she’s a registered Democrat (but says her decision to speak wasn’t politically motivated). Still, as we learned from the accusations against Al Franken, one allegation is a big problem. Two or more become deadly, because there’s always the threat of yet another accusation. And that brings us back to that “higher standard” for Supreme Court nominees — with the Senate Judiciary Committee set to hear from Kavanaugh and Christine Blasey Ford on Thursday. These aren’t allegations against a sitting U.S. senator (like Franken) or someone running for office whom voters can reject (like Keith Ellison). They’re against someone picked for a lifetime appointment to the U.S. Supreme Court. Given that higher standard, as well as the lesson from Franken, it’s increasingly likely that Kavanaugh’s chances of getting 51 votes are over. We just don’t know how this ends. 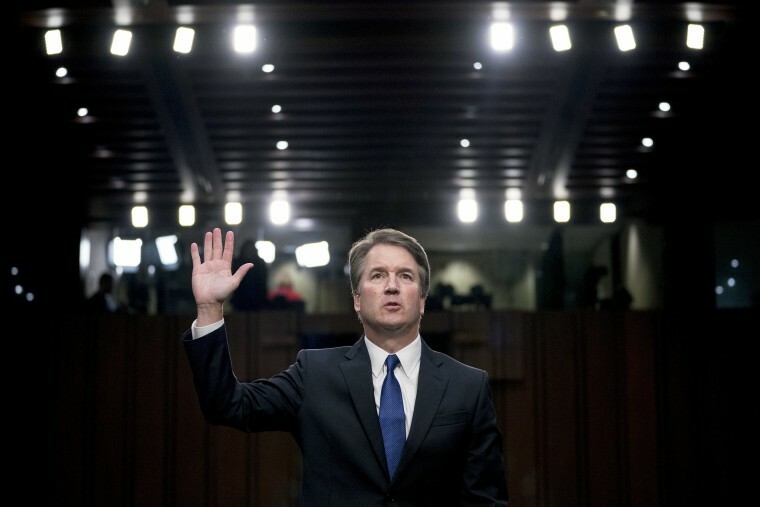 Does Kavanaugh withdraw? Does Senate Majority Leader Mitch McConnell signal that the votes aren’t there — to give Trump and the GOP enough time to name a new nominee? Or is there enough time? A White House official tells NBC’s Kristen Welker that there are no plans to withdraw Kavanaugh’s nomination. This official says President Trump finds decades-old uncorroborated allegations to be something that the White House and Kavanaugh should fight back against. A source familiar with the confirmation process added to NBC’s Peter Alexander that Trump had two conversations Sunday about the latest Kavanaugh allegation — before it became public. The president expressed no change in his views about Judge Kavanaugh, the source said. But Sen. Dianne Feinstein, the ranking member on the Senate Judiciary Committee, said Thursday’s Kavanaugh-Ford hearing should be postponed in light of this second against the Supreme Court nominee. “Thursday's hearing should be canceled in light of a disturbing new allegation of sexual misconduct against Brett Kavanaugh. The FBI must investigate ALL allegations,” she tweeted, per NBC’s Frank Thorp.